The trumpet - a funky promotional product. 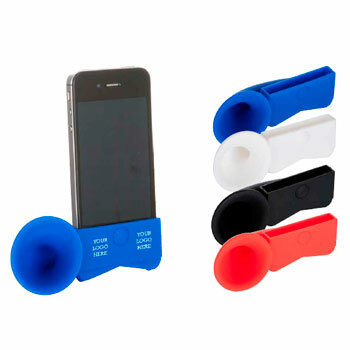 No external power needed, the trumpet naturally amplifies the sound from selected smart phone models. Available in a choice of colours and can be branded with your details. Can hold the phone in place either horizontally or vertically. Made from soft feel silicone material, it's washable, dirt and scratch resisitant. Available in a choice of four standard colours or pantone matched on over 2,000 units. Product Colours: Black, blue, white, red. Print area: 45 x 15 mm. Please contact us for prices and personalisation options.